Washing a vehicle is easy to learn, but takes skill to fully master. This intermediate level vehicle washing tutorial is especially useful for larger vehicles such as RVs and trucks. Pick a brush with the right texture for your type of use. An ideal brush will have soft tip bristles that wrap around the support block. At least one clean bucket with optional dolly. If you have two you can take it to the next level and dedicate one for wash water and one for rinse. An immersion dirt remover such as the Dirt Dropper picture below. Start by lightly soaking your car with water and let sit. I prefer to do this while in the shade. Soaking helps to soften and loosen road grime and debris. Generously add your soap of choice at this point of time to the 5 gallon bucket and fill with water the rest of the way. Doing this step now allows the water to soak further. Use a low pressure power washer to all the way around the vehicle, starting with the roof and working down. Use discretion as to how far back you hold the nozzle sprayer. Too much pressure or being to close with dirt on the car can act like a sand blaster, damaging the paint surface. As the dirt starts to fall you can move in closer. Don’t forget the tires and fender wells. I usually go so far as to open the doors and lightly spray the rubber door seals. If you haven’t yet spoiled yourself by purchasing a power washer, a garden hose with ordinary garden spray ends will still do a great job. Take your vehicle brush and rub it up and down against the side of the Dirt Dropper. This will help to open up the fibers of the brush and assist in removing any dirt in the brush. This is also great way to remove dirt from microfiber mitts. Proceed with washing from the top down. For the best results use the dirt dropper often and don’t over use dirty water, change out the water if needed or use the double bucket system. Now go back around the vehicle and look for any small areas that may need to be touched-up with a microfiber mitt. While washing the vehicle keep it thoroughly wet by rinsing from the top down. A power washer at this time helps to get the remaining loose dirt from any gaps in the doors, mirrors and trunk lids. Rinse well as any dirt left can scratch the paint surface when hand drying. Two methods of drying are commonly used, air drying or hand drying. My choice is with a chamois. With air drying I find that it leaves water spots and rings on the vehicle. There are a couple of spotless water systems out on the market. Rinse out your bucket and brush so it’s ready to go for the next use. Please use caution with open top buckets indoors or out. 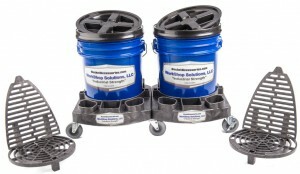 Remove water from buckets or make sure to reseal them. Open buckets are an extreme risk for toddlers! Remember: Doubled detail buckets = doubled productivity. This is a guest post from Rick T, bucket innovator and inventor of The Dirt Dropper, an excellent bucket accessory that easily removes dirt from anything from mitts to long-handled brushes.